Two men have been fined £420 each for poaching and using illegal fishing equipment in County Durham. The Environment Agency has prosecuted two County Durham men for poaching and using illegal fishing equipment. Ian David Cook, 38, of The Grove, Consett, and Michael Fullerton, 22, of Surrey Crescent, also in Consett, were each given a 12 month conditional discharge by Newton Aycliffe Magistrates’ Court on 6 December 2017 after pleading guilty to the offences. They were also each ordered to pay £420 costs. Magistrates heard that on 30 November 2016 Environment Agency fisheries enforcement officers observed Cook and Fullerton shining torches into the upper River Browney near West Butsfield, during a targeted evening patrol. The River Browney and its catchment is an important and improving area for migratory fish, especially sea trout. Recent improvements to aid fish passage and water quality and a robust approach to enforcement have led to an increase in returning fish but at present, stocks remain low and vulnerable. 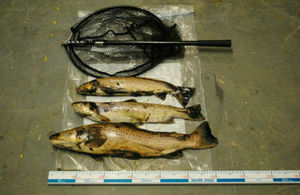 After detaining the men they seized two torches and a landing net containing three dead sea trout, each at various stages of spawning. Under the Salmon & Freshwater Fisheries Act 1975, lights are prohibited, as are landing nets if used without an authorised rod and line. It is also illegal to fish during the close season for migratory fish. During interview, Fullerton admitted to shining the torch into the river and using the net to take fish but denied knowing it was illegal. He also denied knowing it was illegal to take fish during the close season. This was despite him holding a rod licence at the time, which spells out when and how legal fishing can be undertaken. Cook confirmed he understood that using a lamp to either take or assist in taking fish is an offence. This was a serious poaching incident using illegal instruments that could have had a severe impact on future stocks of sea trout in the River Browney. At this time of year sea trout are returning to rivers to spawn and protecting returning fish is vital to maintaining a healthy fish population. That’s why our fisheries enforcement officers work hard to target those people flouting the law and we won’t hesitate to take action. The conditional discharge will appear on Fullerton and Cook’s criminal record. If either commits another crime within the next 12 months they can be sentenced for the first offence and the new offence.